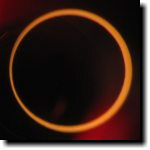 I've just seen the annular eclipse, and what a lovely sight it was! 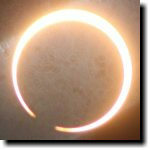 This was only my second significant solar eclipse, the first being a partial when I was a teenager. So I was pretty excited about an annular so nearby -- the centerline was only about a 4-hour drive from home. We'd made arrangements to join the Shasta astronomy club's eclipse party at Whiskeytown Lake, up in the Trinity Alps. Sounded like a lovely spot, and we'd be able to trade views with the members of the local astronomy club as well as showing off the eclipse to the public. As astronomers bringing telescopes, we'd get reserved parking and didn't even have to pay the park fee. Sounded good! Not knowing whether we might hit traffic, we left home first thing in the morning, hours earlier than we figured was really necessary. A good thing, as it turned out. Not because we hit any traffic -- but because when we got to the site, it was a zoo. There were cars idling everywhere, milling up and down every road looking for parking spots. We waited in the queue at the formal site, and finally got to the front of the line, where we told the ranger we were bringing telescopes for the event. He said well, um, we could drive in and unload, but there was no parking so we'd just have to drive out after unloading, hope to find a parking spot on the road somewhere, and walk back. After taking a long look at the constant stream of cars inching along in both directions and the chaotic crowd at the site, we decided the better part of valor was to leave this vale of tears and high-tail it back to our motel in Red Bluff, only little farther south of the centerline and still well within the path of annularity. Fortunately we'd left plenty of extra time, so we made it back with time to spare. One striking thing about watching the eclipse through a telescope was how fast the moon moves. The sun was well decorated with several excellent large sunspot groups, so we were able to watch the moon swallow them bit by bit. 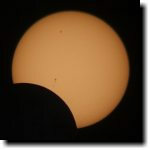 Some of the darker sunspot umbras even showed something like a black drop effect as they disappeared behind the moon. We couldn't see the same effect on the smaller sunspot groups, or on the penumbras. There was also a pronounced black drop effect at the onset and end of annularity. The seeing was surprisingly good, as solar observing goes. Not only could we see good detail on the sunspot groups and solar faculae, but we could easily see irregularities in the shape of the moon's surface -- in particular one small sharp mountain peak on the leading edge, and what looked like a raised crater wall farther south on that leading edge. We never did get a satisfactory identification on either feature. After writing and speaking about eclipse viewing, I felt honor bound to try viewing with pinholes of several sizes. I found that during early stages of the eclipse, the pinholes had to be both small (under about 5 mm) and fairly round to show much. Later in the eclipse, nearly anything worked to show the crescent or the annular ring, including interlaced fingers or the shadow of a pine tree on the wall. I wish I'd remembered to take an actual hole punch, which would have been just about perfect. I also tried projection through binoculars, and convinced myself that it would probably work as a means of viewing next month's Venus transit -- but only with the binoculars on a tripod. Hand-holding them is fiddly and difficult. (Of course, never look through binoculars at the sun without a solar filter.) Look for an upcoming article with more details on binocular projection. For us, the motel parking lot worked out great. We were staying at the Crystal Motel in Red Bluff, an unassuming little motel that proved to be clean and quiet, with friendly, helpful staff and the fastest motel wi-fi connection I've ever seen. Maybe not the most scenic of locations, but that was balanced by the convenience of having the car and room so close by. The mother with medical problems, obviously feeling quite poorly but still bringing her husband and son out for repeated views. the woman who said she didn't want to be in the sun because she'd been drinking too much by the pool. The family where Dad kept looking through paper glasses the kids insisted was a "3-D viewer". Alarmed, we took a look, and found it was a perfectly reasonable eclipse viewer marked SAFE FOR SOLAR VIEWING. Whew! The teen girl who kept looking directly at the sun despite everyone telling her not to ... I hope she didn't damage her vision. The kid who wanted to borrow my binocular to look at some birds circling in the distance. I wanted to let him, but with all the attention on the sun I was too nervous, so instead I changed the subject and showed him how to identify turkey vultures (wings in a V, tipping from side to side) even without binoculars). The man who sat in a parking space near us reading a catalog, telling us repeatedly he was just reading his catalog. When Dave insisted he come and take a look, he looked in the eyepiece for about ten seconds, then looked Dave in the eye and informed him solemnly that he was just reading his catalog. The family who'd been instructed by their grandmother, in the hospital awaiting an operation, to watch the eclipse and bring back pictures for her. I hope they got some decent ones! There's a lot to be said for sidewalk astronomy! Overall, I'm glad we ended up where we did rather than in that Whiskeytown chaos. Here's my collection of Images from the "Ring of Fire" Annular Eclipse, May 2012, from Red Bluff, CA.